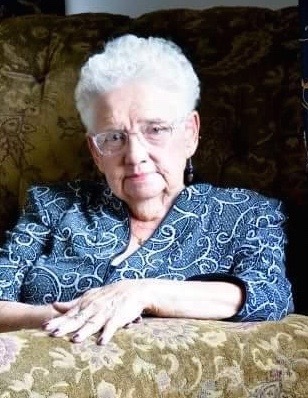 Maysville…..Marjorie Dell Vogel, age 91, was born September 9, 1924 to Paul & Leona Files in Amity, Missouri and died March 8, 2016. On August 26, 1941, Marjorie married Estel Dale Vogel and they lived on a farm north of Amity before moving to Maysville. They had three children and she stayed home to raise them. She later took a job at St. Joseph State hospital where her father worked. She made many friends there and her favorite time was when she worked on the Juvenile Ward with the kids. Marjorie is preceded in death by her parents; husband of 65 years, Estel; three brothers, Donald, P.K., and Charles; sister, Dorothy. Survived by three children, Ronnie (Mary) Vogel, Sandi (Doug) Conway, and Paula Vogel; brother, Manley; six grandchildren, Bill (Samantha) Vogel, Janie (Curt) Prather, Angela (David) Sealey, Tisha (Nick)Cash, Amanda (Gilbert) Flores, & Mike Conway; 14 great-grandchildren; & 2 great-great-grandchildren. Visitation will be 1:00 to 2:30 p.m. and with Funeral Service immediately following at 2:30 p.m. Saturday, March 12, 2016 at Turner Family Funeral Home of Maysville. Memorial Contributions: Amity United Methodist Church. So very sorry for your loss ❤️ If we lived a thousand years, there would never be enough time. God Speed! We are thinking of you in this difficult time. Our love and prayers are with you! I had the pleasure of Taking care of marge and she was an amazing woman and touched my life in many ways. I will miss her dearly. All of her family members will be in my prayers. I loved her and love you all. Thank you for letting me take care of her. She will be in my heart forever. God bless you all. I’m so sorry for your loss. I am a charge nurse at Sunset, and I loved taking care of Marge. She was quite a gal. I had not checked local news lately so did not know of Marge’s passing until just now. So sorry for your loss.